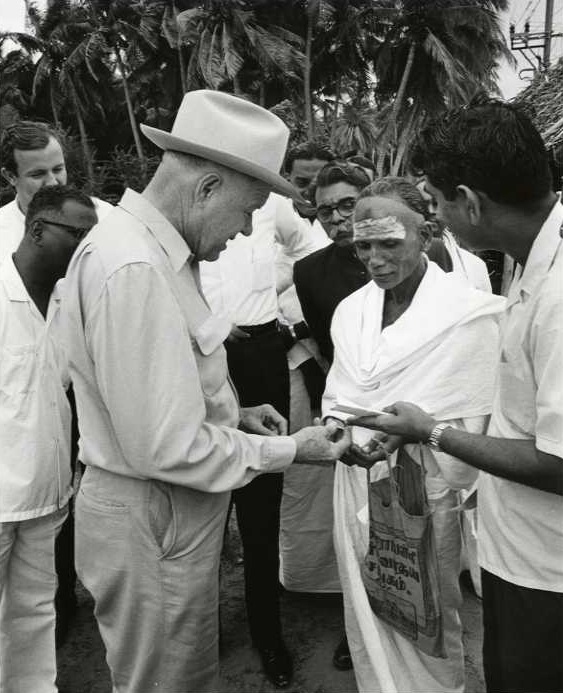 Congressman William R. Poage presents a Kennedy half-dollar to a Hindu holy man in a village in Tanjore District, Madras State. United States Information Service (Bombay, India). "Photograph of Congressman Poage presenting Kennedy half-dollar to Hindu holy man." W. R. Poage Papers, Box 622, File 4, India 17-04-088, December 19, 1966, photograph by R.N. Khanna,W. R. Poage Legislative Library, Baylor University, Waco, Texas.. Accessed 21 April 2019. http://acsc.lib.udel.edu/items/show/130. W. R. Poage Papers, Box 622, File 4, India 17-04-088, December 19, 1966, photograph by R.N. Khanna,W. R. Poage Legislative Library, Baylor University, Waco, Texas.